When your Ford needs a service or repair, you want to take it to someone you can be sure will do a good job with the minimum fuss, and at a good price. Each time you visit CAB. 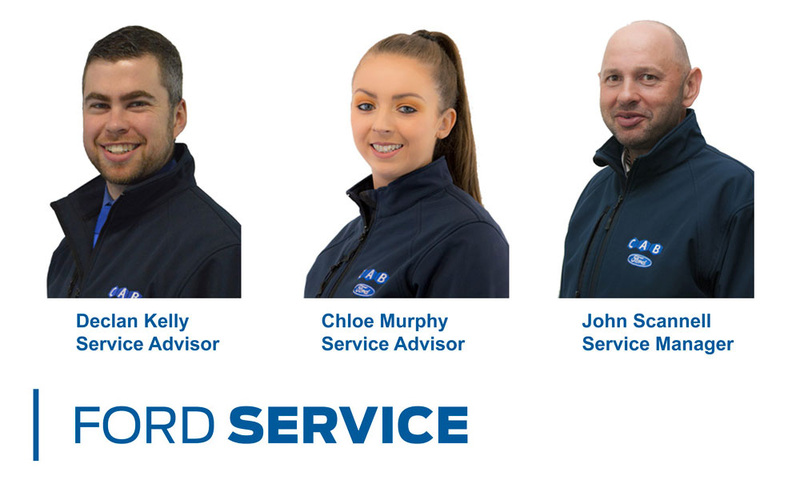 for a service or repair you'll experience the benefits of our 'Interactive Reception', designed to provide the best possible care for you and your Ford. Equipped with a wealth of experience and innovative technologies, we ensure that your Ford is always in top condition enabling you to look forward to maximum driving pleasure at all times. Only Authorised Ford Workshops can provide you with a professional, all round experience that meets both your requirements and the needs of your car. Staff at CAB is of the highest quality, be it sales staff, reception personnel, motor technicians, finance managers etc. As an organisation CAB see our staff to be our greatest asset and this philosophy has resulted in exceptional levels of service throughout all our departments. At CAB we know that it is thanks to our customer that we have been in business for over 90 years. Customer service has always been important and now we have added 10 New Commitments to our Customer Promise. Inspections, Replacements, Servicing.. the list goes on! We also stock a wide range of branded tyres at highly competitive prices with free fitting and for the discerning Ford owner we also stock a wide range of to personalise your vehicle at very competitive prices. Our parts department also carries a full range from the Ford boutique including Caps, Bags, Model cars, Jackets, etc. A full product guide is available on request or in store. To get the best possible performance from your Ford vehicle, only use genuine Ford parts and accessories. Only genuine Ford parts will give you the peace of mind and guarantee that your Ford remains in top condition throughout the life of your ownership. Our dedicated parts & accessories department are open on the weekends, and open late too!